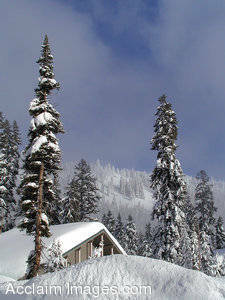 Stock Photo of Crater Lake Resort Showing the Snow Covered Roof Tops. Description: Stock Photo of Crater Lake Resort Showing the Snow Covered Roof Tops. Snow covered building at Crater Lake National Park located in southern Oregon. This image is available for licensing as stock photography or can be purchased as an art print or a poster.